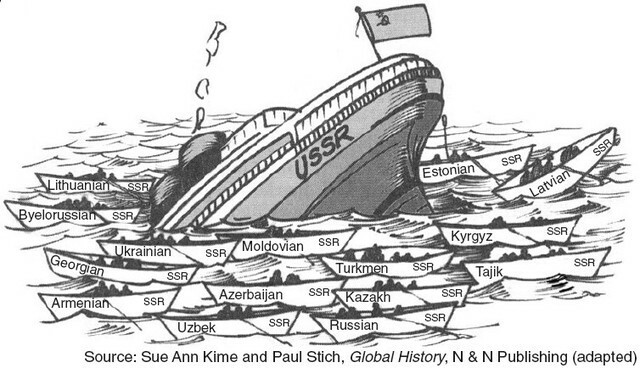 The world watched in shock and awe in 1991 as the Soviet Union disintegrated into 15 individual nations, thus bringing an end to the decades of paranoia and near apocalyptic threats that had been the Cold War. Many scholars have joined the ongoing debate as to the key reasons behind the collapse of the Eastern Superpower yet over two decades later a general consensus has still not been reached. This is mainly, perhaps, because though the collapse of the Soviet Union was quite sudden, its decline and fall was a long and arduous process and to attribute any sole reason therefore to the eventual collapse would be a gross oversimplification of events. That being said, the USSR (The Union of Soviet Socialist Republics) was built largely on the unsustainable resources of ideology and terror so could be argued to have held the seeds of destruction within its very existence. Therefore, this paper intends to consider the importance of individuals, the power of the people (specifically the revolutions in Eastern Europe) and the USSR’s internal issues in order to then conclude to what extent any factor might be most responsible for the eventual collapse in 1991. The decisions of a select few powerful individuals largely moulded the course of events throughout the Cold War, particularly in its final years, and none played more of a role in the collapse than the final Soviet leader himself, Mikhail Gorbachev. Indeed as Daniel C. Thomas identifies, despite the arms race and spheres of influence post 1945, the Cold War, at its heart, was an opposition of ‘political systems based on incompatible state socialist and liberal democratic conceptions of political legitimacy’. Therefore when Gorbachev’s policies saw the East move away from state socialism and become more liberal with freedom of speech and hold a greater respect for the rights of individual nations in Eastern Europe it made negotiations between the USA and USSR far easier, thus undermining everything that communism stood for. This new Soviet direction and move towards peace can be clearly seen in a speech given by Gorbachev to the European Council on 6th July 1989 in which he introduces his ideals of ‘Perestroika’ (restructuring) and ‘Glasnost’ (openness) and states that they will help Russia to merge into a unified Europe alongside the USA. Of course Gorbachev didn’t intend upon the collapse of the USSR through his policies and couldn’t have foreseen that they would eventually lead him to be overthrown in a coup led by the Russian President Boris Yeltsin. On the contrary the real reason behind Gorbachev’s policies was a last ditch effort to in fact ironically save the USSR as its economy was failing, as seen in that same address to the European Council where he quotes Victor Hugo’s ideal of open trade markets for the US, USSR and Europe in the hope of stabilising the USSR through consumerism. Unfortunately for him Gorbachev’s domestic policy changes saw the end of the communist socialist state which, despite the already weakening state of the USSR, ensured its more immediate collapse and indeed as Thomas identifies, the Cold War might have continued for several more years if not for the sudden leaning towards freedom and democracy in the East. Gorbachev himself even admitted in his resignation speech that he had been responsible through radical change for putting ‘an end to the Cold War and the Arms Race’ though he apparently considered it, at that point, an achievement and he was indeed rewarded with the nobel peace prize in 1990. History is written by the victor and as the surviving superpower in 1991 there is a strong emphasis in many scholarly works on the role of US President Ronald Reagan in bringing about the collapse of the Soviet Union though in reality he achieved little with his hard-line approach for which he is praised and instead made more progress when taking a more conciliatory approach, allowing Gorbachev to, foolishly, adopt a more democratic approach.